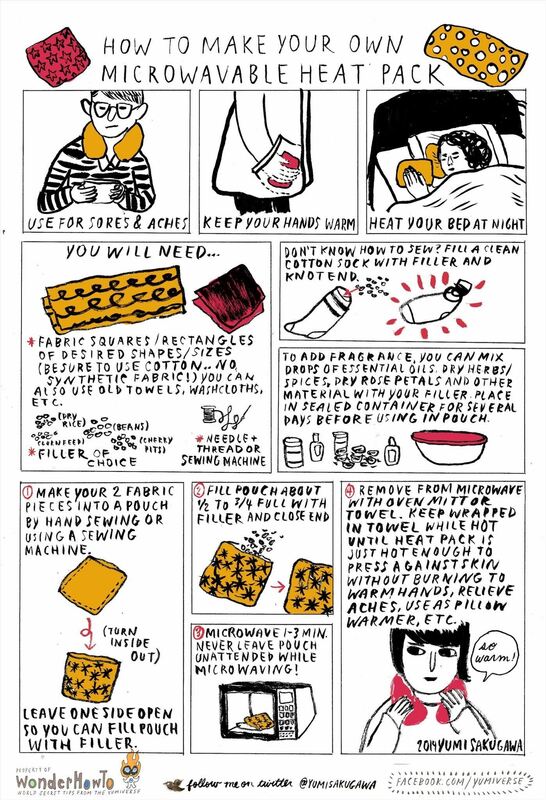 Using dry beans and and some scraps of cotton fabric, you can make your own DIY microwavable heat pack which can be used to relieve sore muscles, warm your hands when stepping outside into cold weather, heating up your pillow case on a freezing night, and more. In lieu of dry beans, you can can also use a variety of other common food items as your filler, such as rice, flaxseeds, corn feed, cherry pits, etc. You can use pretty much any square or rectangle of cotton fabric (avoid using synthetic material) to construct your pouch with a sewing machine or a needle and thread. If sewing is not your forte, you can simply fill an old (clean) sock with your choice of filler and knot the end for a super-lazy and effective microwavable heat pack. Rock salt will work better (it stays warm longer) plus it will help to remove excess water from your bones and relieve arthritis and muscle pain.